Don’t ever give up when your best-loved foods fall off your “to-eat” list. With a low-carb lifestyle, creativity reigns and we are here to tell you that there is life without breadcrumbs in your stuffing – and what a beautiful and delectable world it is! Before you get to the actual stuffing, you may want to have something to stuff, such as a whole chicken or a turkey breast. Naturally, you can serve the Keto stuffing on the side, and we highly recommend that too (stuffing is more than something to stuff! ), just make sure that some cranberry sauce is present on the table for that all around special dinner occasion. In the first step you will need to obtain some quality turkey or pork sausage and remove the casings. 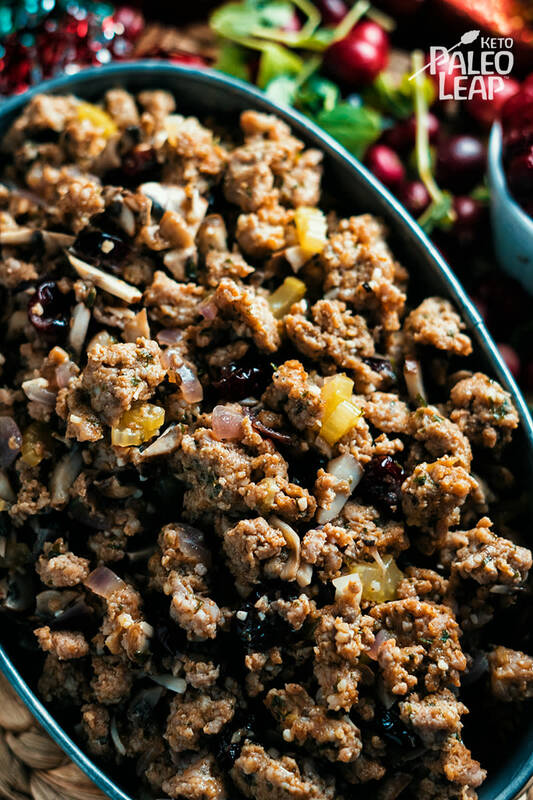 Ground meat works just as well, if you cannot find sausage without a ton of additives, keeping in mind that a good dose of fresh herbs will be added to the stuffing. Make it a point to look for cranberries without added sugar, but don’t stress too much over one detail, as sometimes the simplest of desires are nowhere to be found. Instead, focus on the love and energy going into the dish. It takes about an hour to make and bake the stuffing, and in the meantime you have the freedom to take a nap, or to make a crunchy cucumber and radish salad. Both are healthy choices, choose what your body needs in the moment. Melt ghee in a skillet over medium-high heat, add the onion and garlic; cook 1 to 2 minutes. Crumble the sausage in the skillet, and cook 2 to 3 minutes. Add the celery and cauliflower; keep cooking, stirring 3 to 4 minutes longer. Pour the mixture in a bowl and let cool. Add the remaining ingredients and season to taste, give everything a good mix and place in a baking dish. Bake in the preheated oven 20 to 25 minutes. Alternatively, you can mix all the uncooked ingredients in a bowl, season to taste, and stuff inside a turkey or a duck for the entire cooking time of the bird.